Wall-Mounted Display Cases and Trophy Display Cases are secure ways to display all of your accomplishments and collectibles. Memento Cases for DieCast cars and action figures come with adjustable shelves for flexible changes as your collection grows. Wall-Mounted Floor Display Cases keep heavy Display Cases from being jostled and breaking your items. Locking Wall Display Cases with lights draw attention to your Display Case. Enclosed Bulletin Boards are also wall-mounted cases that display writing, announcements, and any pinned items you may want to call attention to. Display Cases with custom headers make your brand stand out. Wall Mounted Literature Display Racks allow people to see your product and use it, while keeping your rooms clean. Wall Mounted Conference Room Cabinets also display temporary messages and items. 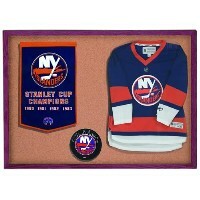 Check out all of your Wall Display Case options and think beyond trophies and collections. Keep eyes on and hands off your best collectibles!